Shape. Among the shapes available, the hemispherical shape may give the best results because it spreads out compression and shear and is similar to the native acetabulum, Dr. Garvin said. Surface modifications and coatings. The surface of the implant is often modified or coated to promote bony ingrowth. Modifications with materials such as sintered beads and TiMesh® have been associated with successful bony ingrowth, especially those with a pore size of 100 to 400 microns. Surface coatings have not performed as well, Dr. Garvin said, partly because they are applied to two-dimensional surfaces that fail to promote bone ingrowth once the coating has been absorbed. Acetabular fixation. Acetabular fixation helps to improve the initial stability of the hip implant. Although all fixation methods have performed well, Dr. Garvin noted that some studies have shown the use of screws to result in the best and most predictable bone ingrowth. However, one large study showed no advantage or disadvantage to using screws compared with other fixation methods, he said. Implant material. Implant materials with a modulus of elasticity close to that of bone (eg, porous tantalum) provide the most predictable bone ingrowth, according to Dr. Garvin. Interface between socket and implant. The size of the gap in the interface also affects the amount of bone ingrowth. Gaps larger than 2 mm and those 0.5 mm and smaller result in less bone growth. During a hip replacement procedure, the hip socket should be adequately exposed to reveal the acetabulum. All soft tissue from the rim should be removed to prevent trapping of soft tissue between the socket and bone, which will prevent bony ingrowth. Acetabular shells that are oversized by 1 mm provide optimal stability and reduce fracture risk to a minimum. However, overly large shells may increase the risk of fracture. Well-vascularized host bone is associated with better outcomes than bone with lower vascularity. Bone ingrowth is also affected by local host factors such as radiation therapy and osteonecrosis, as well as by systemic host factors such as metabolic disease and medications. 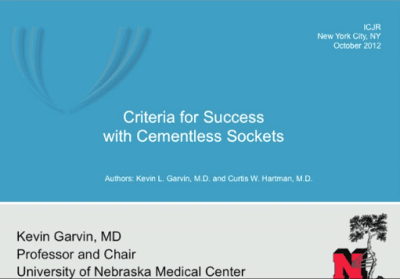 Click the image above to watch Dr. Garvin’s presentation. Next articleShould We Be Concerned about Stress Shielding in TKA?